This page is a translated version of the page Cameron and the translation is 100% complete. The company's origins date back to the activity of Nisbet MacNiven that in 1770 founded a factory in Balerno, near Edinburgh, the city where activities on stationery production were transferred in 1788. 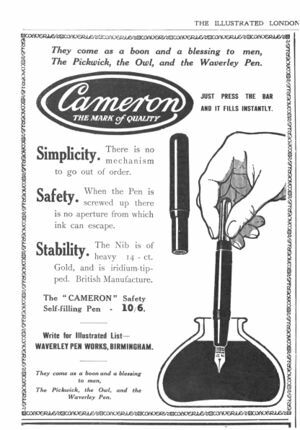 In 1840 John and Donald Cameron joined the company that became the MacNiven & Cameron Ltd. Duncan Cameron is credited with the design of the Waverley nib produced by Gillot Steel Pens since 1864 and roughly until the mid-70s of the 19th century. The company acquired a factory in Birmingham in 1900 and continued to produce nibs working in the stationery products market up to the closure of the factory in 1964. The company entered the fountain pens market in the 10s (at least since 1916, as evidenced by the advertising in the figure, and a patent, nº US-940509, is from 1908); it was also active in the French market. The cited advertising suggests the presence of a main office in London with branches in Glasgow, Edinburgh and Paris. Another model name known (present in another flyer) is Guinea Pen, instead between the brand photos there is a lever filler model called "Cameron N.4". The same pens were distributed in France at the end of World War I from Kirbie, Bird C. based in Rue Auber, 5 in Paris, with the name SAR Cameron (where however SAR is nothing more than an acronym for Safety Auto Remplissage). The company apparently remained active until 1964, even if someone is reporting an earlier end to production. ↑ The company is also cited by Lambrou for the production of Waverley pens, that name, however, seems to has been used only for the nibs of the same name. This page was last edited on 12 January 2019, at 14:33.